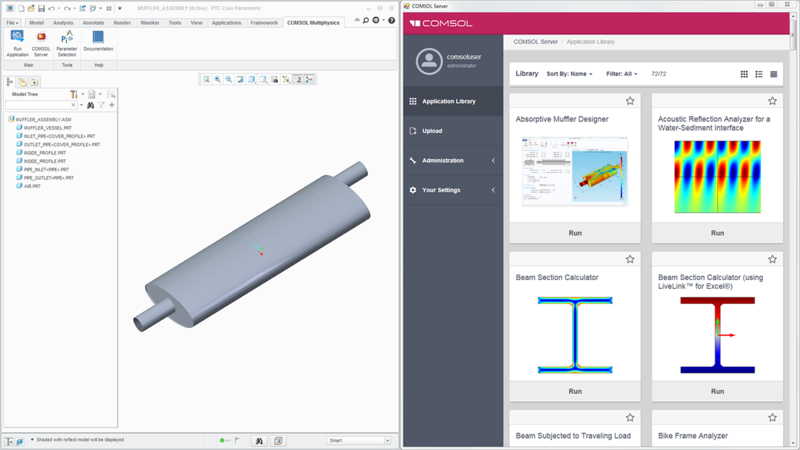 For users of LiveLink™ for PTC® Creo® Parametric™, COMSOL Multiphysics® version 5.2a makes it possible to connect to COMSOL Server™ from within PTC® Creo® Parametric™. It is now also easier to keep track of synchronized documents. Review all of the LiveLink™ for PTC® Creo® Parametric™ updates in further detail below. When you have installed COMSOL® Client, a button will be made available for connecting to COMSOL Server™ from within PTC® Creo® Parametric™. This means that you can browse and run apps together with PTC® Creo® Parametric™, including apps that use geometry that is synchronized with PTC® Creo® Parametric™. The COMSOL Multiphysics® tab in the PTC® Creo® Parametric™ user interface (left) and the COMSOL Server™ interface, which is launched in a separate browser (right). Clicking on the COMSOL Server™ button within the PTC® Creo® Parametric™ user interface prompts the Connect to Server dialog box, where you enter settings for connecting to COMSOL Server™. 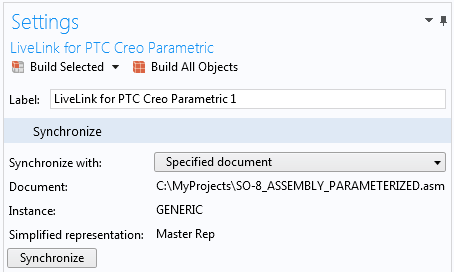 In order to prevent synchronization with an incorrect CAD document, the LiveLink™ for PTC® Creo® Parametric™ interface now keeps track of the file name and path, as well as the instance and simplified representation of the synchronized PTC® Creo® Parametric™ software design. During the first synchronization, the file name is retrieved and documented. For subsequent synchronizations, the interface automatically selects the same file in the CAD software, as long as the file is open there, and automatically switches to the previously synchronized state of the design. A complete list of supported CAD file formats is found in the CAD Specification Chart under the "Read from File, CAD" and "Write to File" sections. PTC, Creo, and Creo Parametric are trademarks or registered trademarks of PTC Inc. or its subsidiaries in the U.S. and in other countries. ACIS is a registered trademark of Spatial Corporation. Autodesk, AutoCAD, and Inventor are registered trademarks or trademarks of Autodesk, Inc., and/or its subsidiaries and/or affiliates in the USA and/or other countries. Parasolid and NX are trademarks or registered trademarks of Siemens Product Lifecycle Management Software Inc. or its subsidiaries in the United States and in other countries. SOLIDWORKS and CATIA are registered trademarks of Dassault Systèmes SolidWorks Corp. All trademarks listed herein are the property of their respective owners, and COMSOL AB and its subsidiaries and products are not affiliated with, endorsed by, sponsored by, or supported by those trademark owners. For a list of such trademark owners, see http://www.comsol.com/tm.